Open containers found in crash that killed 5-year-old Newark boy, hurt 5 others in Pa.
LOWER SAUCON TWP., Pennsylvania (WABC) -- A 5-year-old boy from Newark was killed and four adults and a 2-year-old girl injured in a horrific crash in Pennsylvania early Wednesday. The crash happened on I-78 in Lower Saucon Township near the Hellertown interchange around 1 a.m. According to state police, a 2011 Nissan Versa traveling in the left lane veered off the road and onto the left shoulder. The driver quickly over-corrected, crossing both lanes and hitting the right guard rail before ending up back in the left lane. 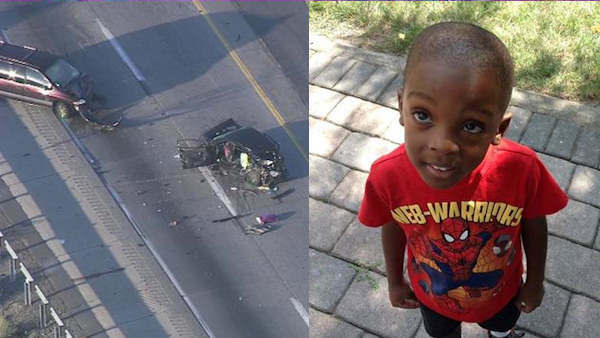 Police say all three passengers from the Nissan -- 5-year-old Rayvon Robinson, 2-year-old Briel Robinson and their 31-year-old mother, Stephany Stephens -- were thrown from the vehicle. The boy was pronounced dead at the scene. The driver of the Nissan, identified as 54-year-old Nadine Walton, the children's grandmother, was taken to Lehigh Valley Cedar Crest Hospital with injuries described as serious. Police say open containers of alcohol were found in her car. According to their grandfather, Briel is on life support, while the mother and grandmother are being treated. Richard Stephens is too ill to travel to Pennsylvania, and he's also caring for the children's great-grandmother, who is devastated. "He was my little angel," he said. "He was the life of the party...He was going to be something special. He remembered your name, and he met you two, three months ago...He was already the top student in his class." All lanes of I-78 East were shut down for nearly 11 hours between Route 412 and Route 33 as police investigated. An extensive backup, consisting mostly of tractor-trailers, was visible approaching the scene.